But no longer. Expect the US Treasury to raid Wall Street for much needed funds over the next few weeks to stock up for hurricane relief, military provisioning etc. The debt level will now be able to catch up to the level of deficit spending that Washington can’t live without. As a result, the gross national debt will likely jump a whopping $800 billion next month. Never to be repaid of course but to be serviced forever. Right now the US finds itself in a favorable position in that people are willing to lend to the country in massive amounts. This pattern of debt ballooning quickly after raising the debt ceiling is not unusual. 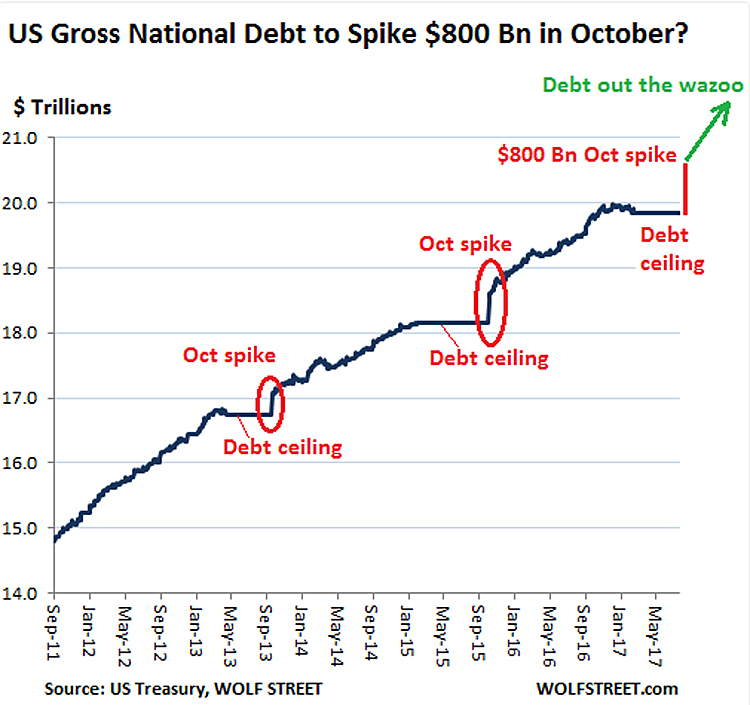 In the below chart, you can see the pattern of debt ceiling charades over the last few years. Having kicked that can down the road, we can now look forward to an attempt to reform the tax code. Personally, I give passage of this initiative about the same odds as repealing and replacing Obamacare. As I wrote last December, I see zero probability of any of Trump’s agenda actually getting into law. That was a pretty good guess and I see no reason to change it. Washington was made to break hearts and budgets. One more thing: what impact will it have when the US Treasury sells $800 billion in securities into the market just as the Fed also looks to reduce its balance sheet? Two big sellers at the same time? The pressure on financial system liquidity could make for a very interesting time for the stock market. Something to watch closely.